Of course pirates don’t lay eggs. But from my nether regions, I have birthed hearty Pirate Easter Eggs . 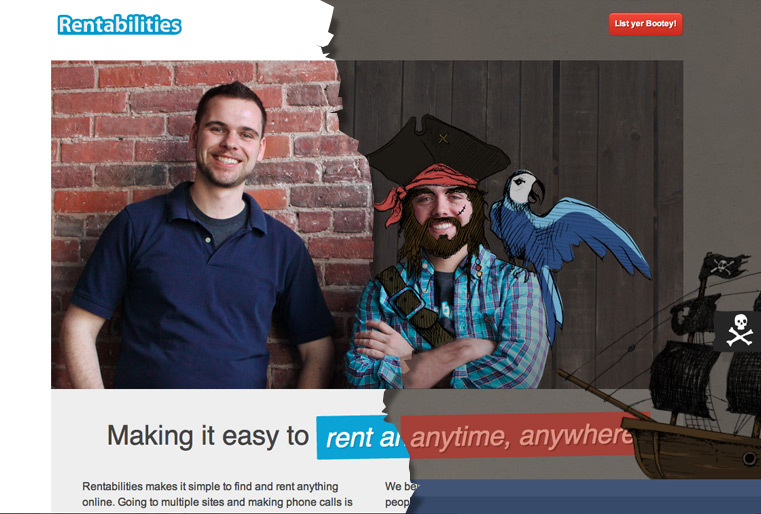 Easter Eggs are fun, and when my friends at Rentabilities decided they wanted to let customers, investors and competitors alike get to know them better, it was obvious that we needed to let their inner pirates show. Though most of their days are focused on building a great product and listening to their customers, the guys at Rentabilities are known in the Boston startup scene as “those guys who threw the 1000 Startup Pirates party” last year in the Boston Harbor. And so to the regular visitor, we present the reliable team that keeps Rentabilities afloat. But to that adventurous soul who clicks the pirate flag, we reveal the swashbucklin’ crew. Not only that, we fire canons at you. Clicking the flag also reveals a contact form for pirates-to-be, and a bookmarlet I created for them that is surely going to make the internet a better place. Definitely a fun process. From the photo shoot, to the pirate sketches, to animating the cannon-ready ship, and the bookmarklet. Now I’m wondering if I should have asked for payment in Bouncy Castle rentals for life. Hey there, Jonah. Love your projects. Just wanted to give you a heads-up on a typo, on http://www.jonahgoldstein.com/site/pirate-eggs/. Just do a find/replace for “bookmarlet” and you should be all set.